You are here: Home / More confidence? Our preferred measure of consumer confidence, the Roy Morgan survey, has risen considerably over the last two months – and another set of data is due out of Friday, woohooo. However, this is not the only measure of consumer confidence – ultimately they all have some value. 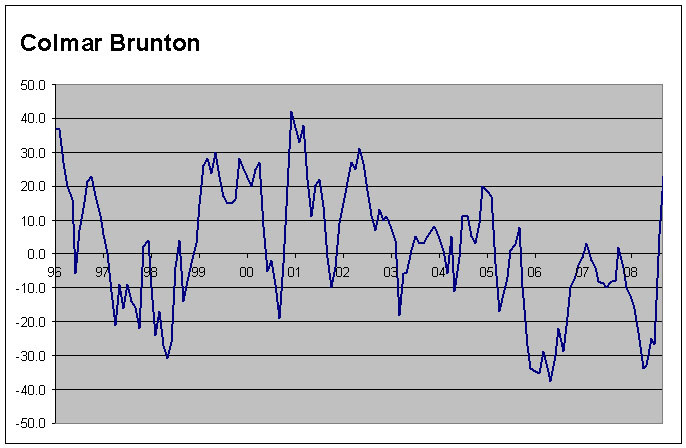 On Sunday, the Colmar Brunton consumer confidence survey was released for September. This survey was taken mostly before the massive 50 basis point cut to the official cash rate – but according to this document it was still at 23%. This was the highest value of consumer confidence since June 2002! To understand this result we have to think what this survey asks. It asks whether consumers expect the economy to be in a better state in 12 months. Part of the reason the figure is so high is because the economy is perceived (or even is) in a bad state right now! As a result, this figure needs to be taken with caution. In a week the gold plated consumer confidence survey (as CPW calls it) is out – the Westpac McDermott Miller Consumer Confidence Index. Like the Roy Morgan survey, this survey takes into consideration households view of their own balance sheet, and the outlook for the household – beyond any expectations of the general economy. If this one picks as substantially as the others then consumer confidence is off rocking again in September – surely indicating an increase in consumer spending is on the cards. http://www.tvhe.co.nz/wp-content/uploads/logo-for-enfold-photoshop.png 0 0 Matt Nolan http://www.tvhe.co.nz/wp-content/uploads/logo-for-enfold-photoshop.png Matt Nolan2008-09-17 14:00:312008-09-17 14:00:31More confidence? Blog issues How much poorer is New Zealand than Australia?